The most delicious easy lunch recipe! We all know that a hearty lunch is the best way to keep your energy up and avoid late afternoon cravings. But its not always practical to cook during the day, especially with the kids running around the house! We have been researching and have found the perfect easy lunch recipe just for you. It is called tigania and it’s guaranteed to delight you with its fantastic flavor and color! Tigania is a Greek dish that combines some juicy pork and spicy good-quality sausages and takes it’s name by the pan that is cooked in, which is called tigani. This dish will become one of your favorite easy lunch recipes! Reminder! Make sure you have all your ingredients ready to go for this fast and easy recipe. It will shave valuable time off your cooking and save you a lot of stress! To prepare this easy lunch recipe, start by washing the pork thoroughly. Heat a large frying pan at high heat, pour in the olive oil and add the sausages and the pork. Sauté for 4-5 minutes, until nicely colored on all sides. Add the peppers and onions, and sauté for 3-4 more minutes. Pour in the tsipouro and season well with salt, pepper and a pinch of paprika. Into a bowl add a cup of water and 1 tbsp mustard and blend. Add the water into the pan and stir. Cook until most of the juices have evaporated. Add the wine, a good pinch of oregano and simmer with the lid on at medium heat for 6-7 minutes, until most of the juices have evaporated. 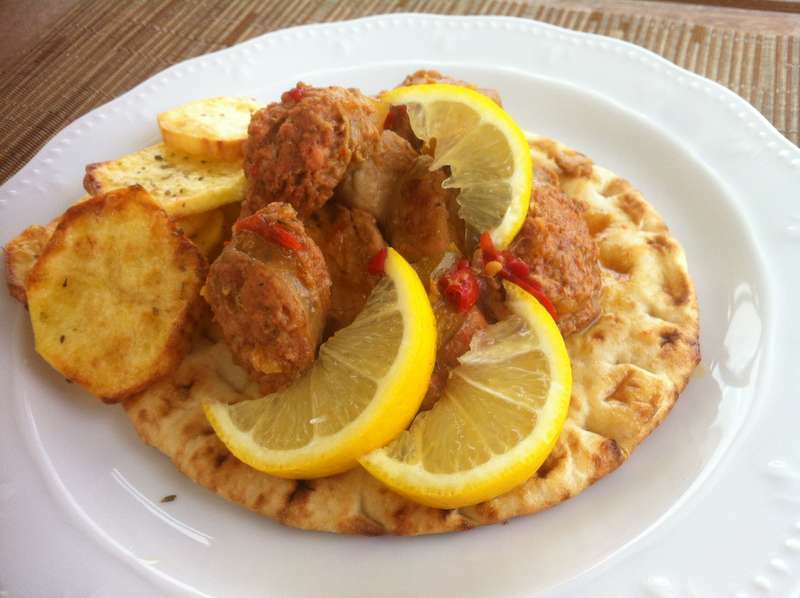 Serve with some pita breads and potato chips and enjoy one of the most delicious Greek easy lunch recipes! I am from Malta! I love your recipes. What is Tsipouro pls? Can I substitute it pls, as we don’t find it here!! Hi maria! Glad you like our recipes! Tsipouro is a pomace brandy from Greece. And you’re right, though it is very popular in Greece, it may be hard to find in other countries. Drinks with similar taste are greek ouzo and Italian grappa. If you substitute tsipouro with ouzo or grappa, use half a glass. If have neither, then use only the white wine. I’m sure it will still be delicious!